Hi guys, I hope you guys have had a fantastic weekend. It's June and I sure do have some very exciting posts for you all. I can't wait to share all the secrets I've been holding on to. Just think of me as a pinata about to explode! The first post in this month has to be a whammy, so today I have to share with you My True Love (MTL) Polish's True Blood Collection Pt 1. This collection will be releasing this Friday, June 6th! 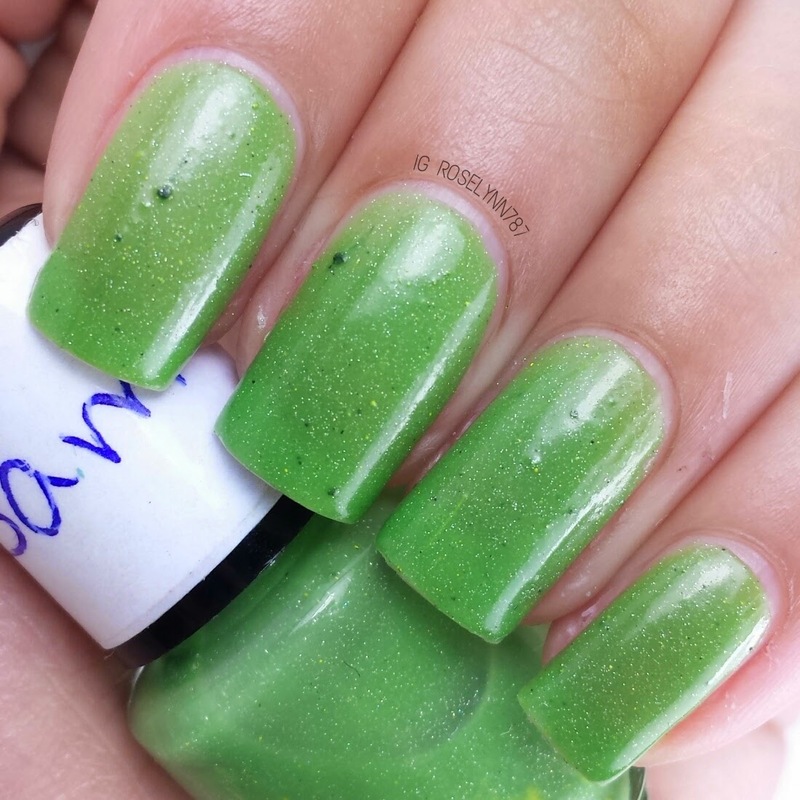 Sam is a thermal jelly polish that shifts from a lime green when warm to a darker green when cold. Anyone who knows me knows that I love a thermal polish, like every day all day. I like the color combination for the transition, it's gorgeous in mid-transition. The micro glitters definitely make this polish come to life for me. At first I thought the darker green dots might be glitter, however, it was brought to my attention that it's actually powder chunks. Swatched over a clear base, used three thin coats, and sealed with a fast-drying topcoat. The color transition with the climate change is flawless and immediately noticeable. 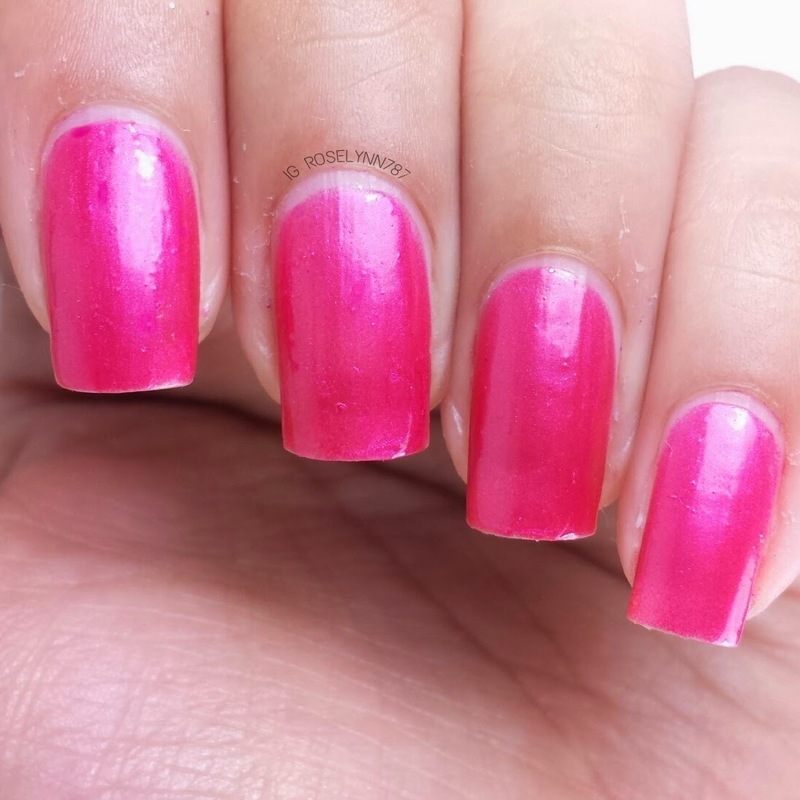 Since this is a jelly polish, it will be very sheer in one coat and will need at least three coats for full opacity. 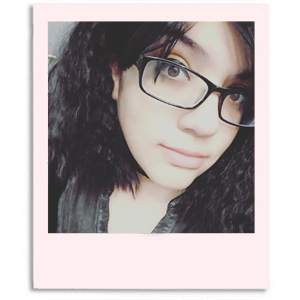 Although it needs a few layers, the formula is pretty good and allows for layering without clumping. *** As you can see the the photo below, the bottle had a bit of yellow in it. Don't be alarmed, it didn't affect the polish whatsoever. This bottle was also made for testing purposes so the ones for the release might not be affected like this. The supplier is making a change for this is particular color possibly for this reason. As I mentioned before, this batch did have some chunks of powder as you can see in the photos. 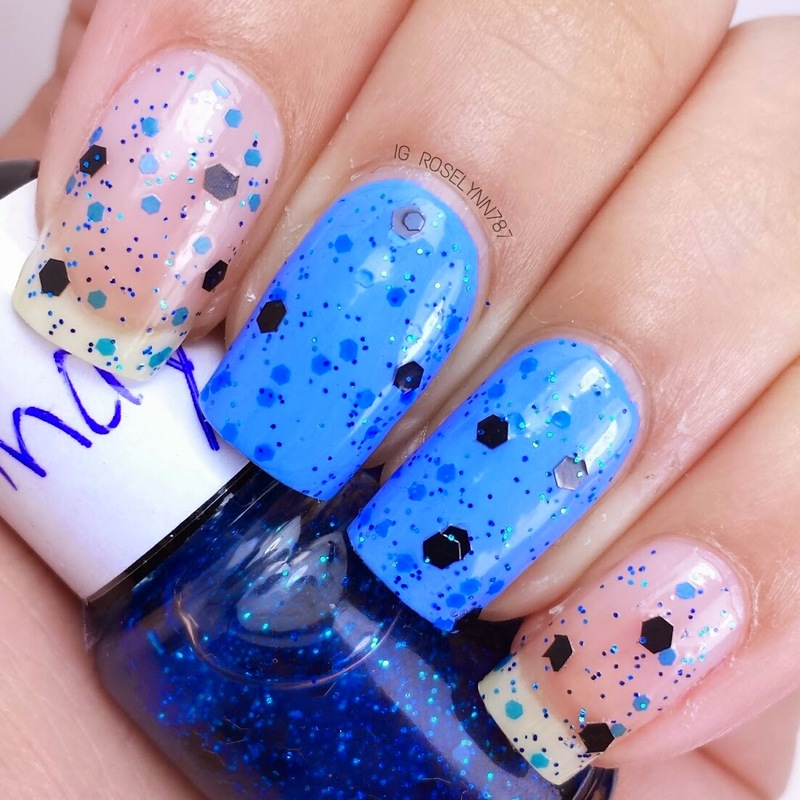 Andy is a clear glitter topper filled with blue and black glitters of various sizes, including dark blue micro glitters. Favorite alert! The glitter combination is perfection. I do have to mark this one down as a must-have for glitter lovers. It's eye-catching without being obnoxious. Perfect for the casual chic type of girl. I'm telling you guys, I seriously did not want to take off this swatch after I was done. Swatched on my middle two fingers over Orly Snowcone and on a clear basecoat on my index and pinky. These swatch photos have three thin coats and are sealed with a fast-drying topcoat. Formula on this glitter topper was excellent, there was no placement or dabbing done for these photos. No glitter fishing, major plus. 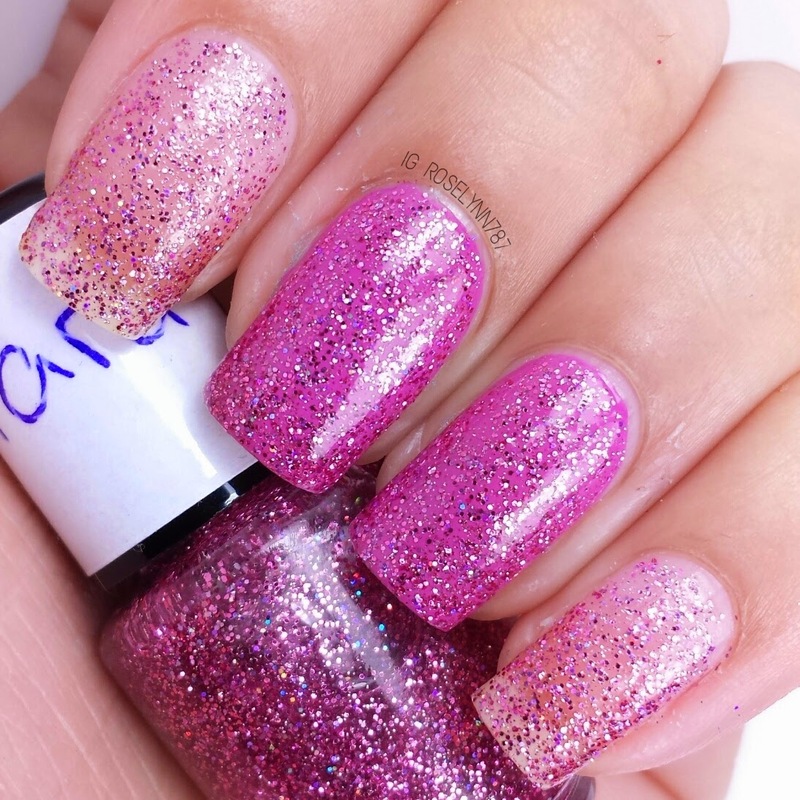 Tara is a cute berry pink sheer micro glitter-bomb. I don't know what it is about this polish but it has cuteness written all over it. It must be the mega amount of micro glitters jam-packed into this polish. 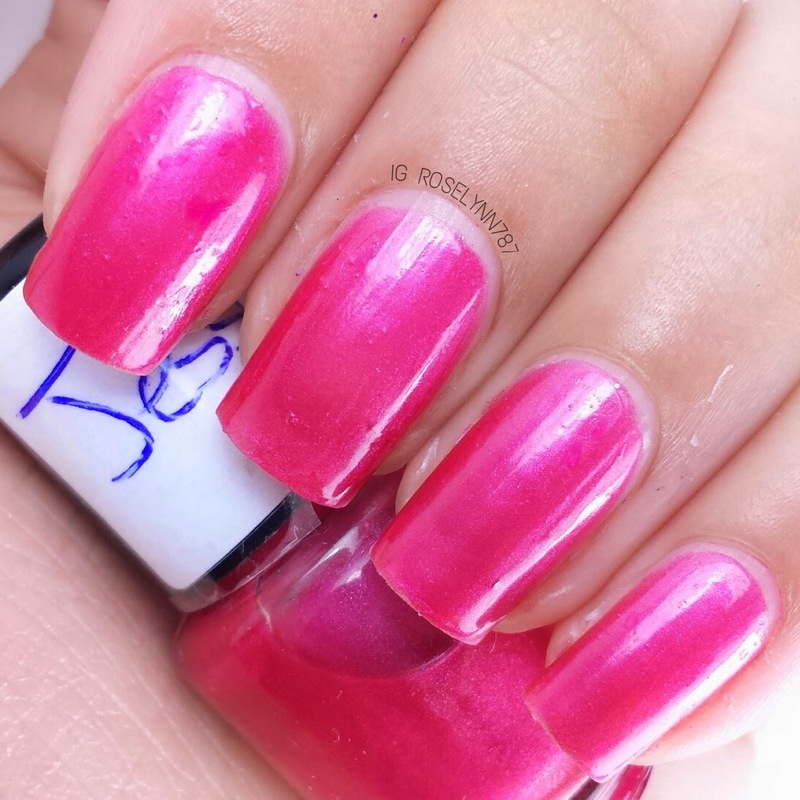 Very girly and fun, date night polish if I ever saw one. Swatched on my middle two fingers over Julie G's Rio De Janeiro and over a clear base coat on my index and pinky. As you can see, this polish does have a light pink tint to the base. If you layer about 4 thin coats of just this polish, you should have a good amount of opacity. Formula was good and easy to work with. Just make sure to finish it off with a topcoat to give it a beautiful glossy finish. 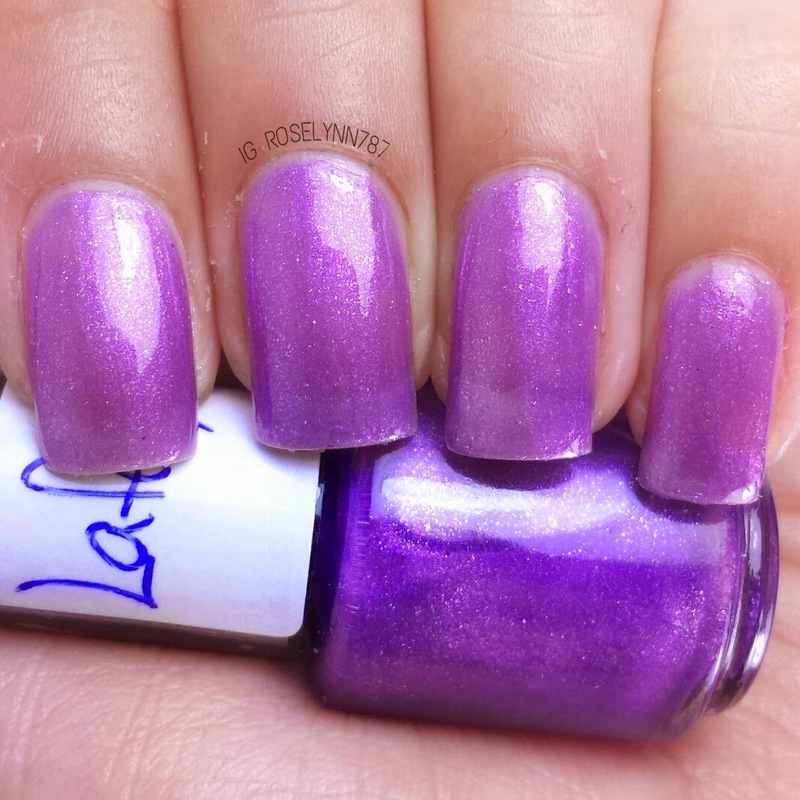 Lafayette is a perky purple polish (tongue-twister not included) with a very slight shimmery finish. I've been a little purple (and teal) obsessed lately due to my nail bestie, so I was thrilled to receive this beauty. It has a airy-type of summer-time feel going on and I love it. Swatched over a clear base coat, used three thin coats, and sealed with a fast-drying topcoat. This polish is almost like a jelly so it's extremely sheer in just one coat. 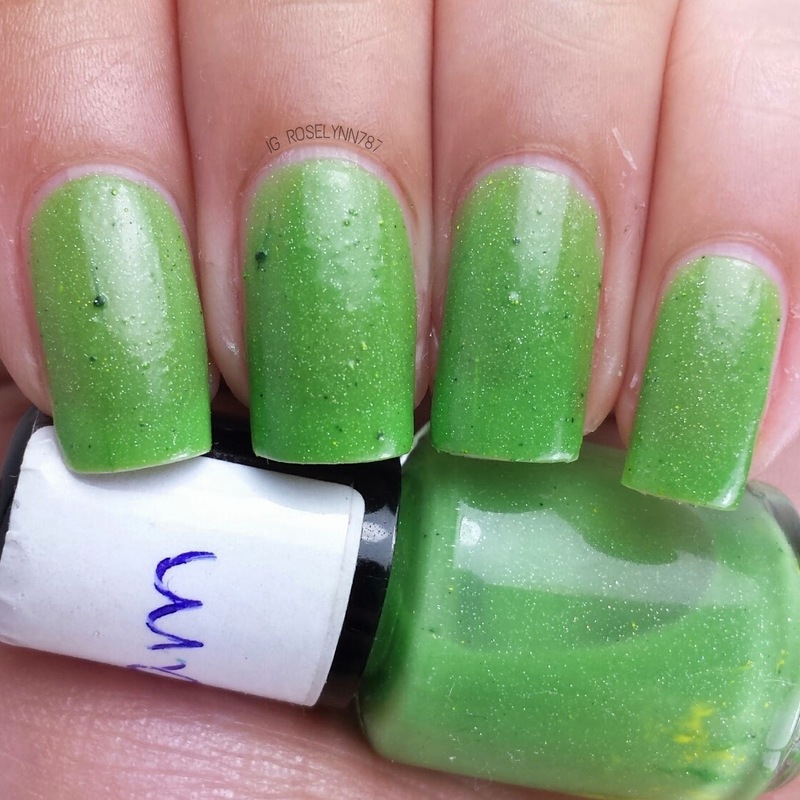 I used about three coats for these swatch photos, however, for full opacity you'll probably need another layer. I recommend using a topcoat for a quicker dry-time on all those layers. 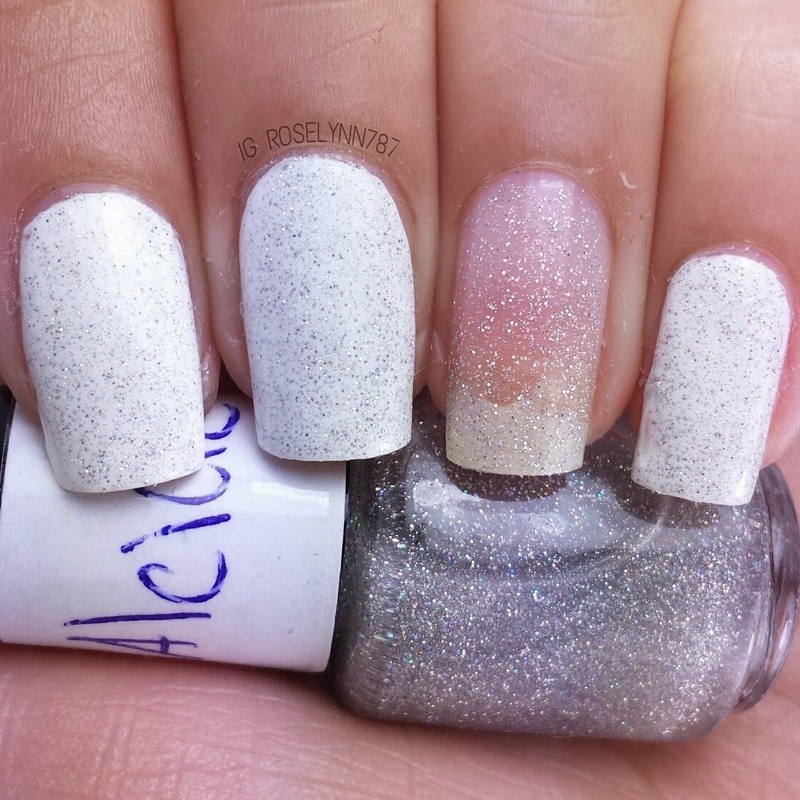 Alcide is a beautiful silver micro glitter topper filled with holo goodness. 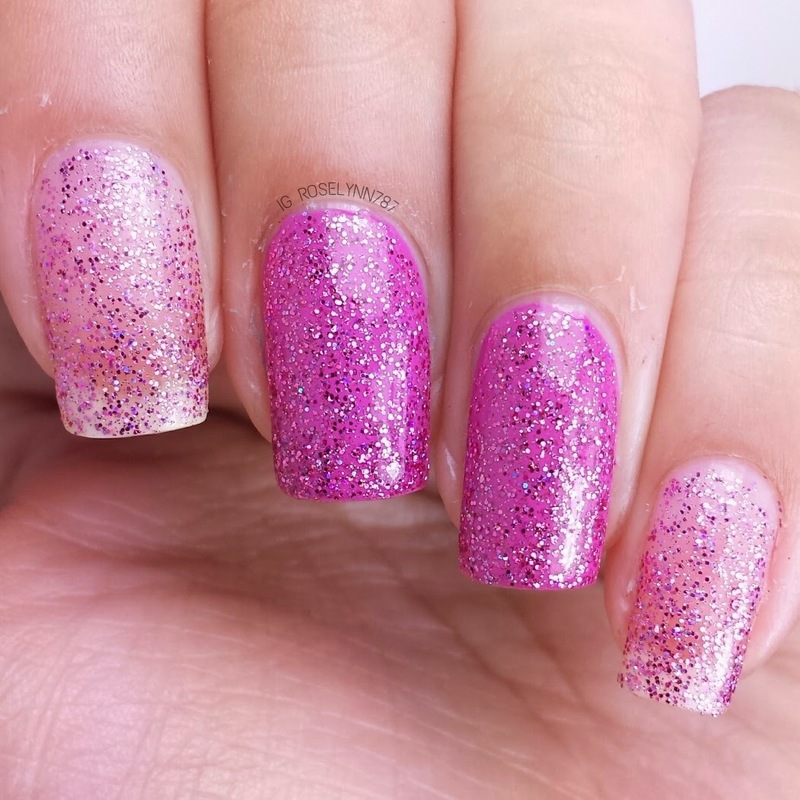 Think Fairy Dust by China Glaze but with a lot more micro glitters. I think this is a gorgeous glitter topper with a lot of practical usage. You can put this on over just about any type of mani to make it sizzle. I personally plan on adding this over a gradient or watermarble mani every time. If you have not experienced a topper like this before then you definitely have to make it a point to try this beauty out. Swatched over a white base except for my ring finger, used two coats, and sealed with a fast drying-topcoat. Formula was excellent and didn't suffer from a mini bottle, a very good sign. I felt I only needed two coats because each stroke is so glitter-packed. As you can see on my ring finger, this polish is a clear topper with no base color. 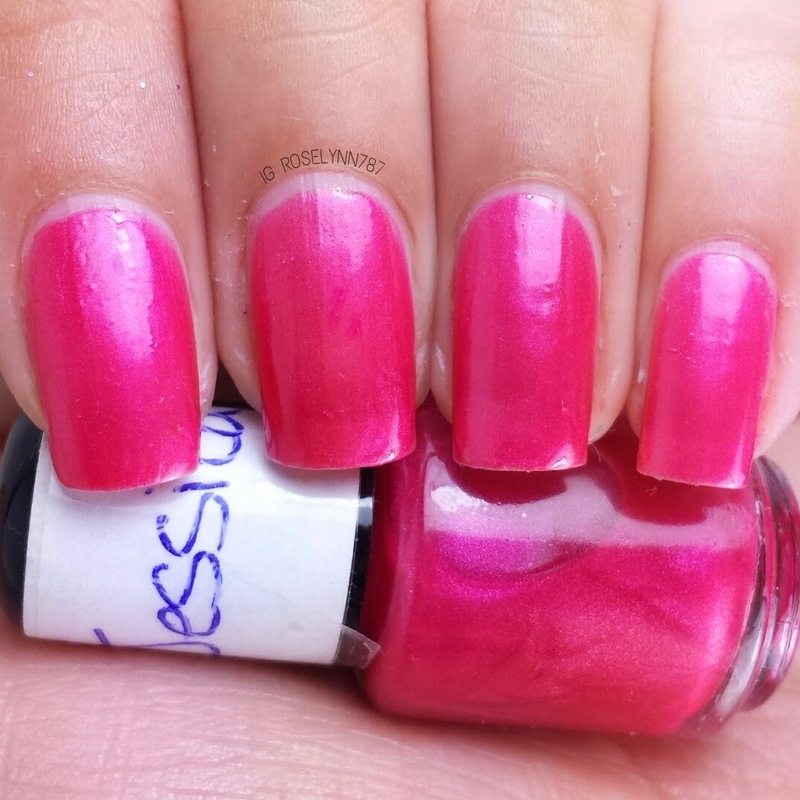 Jessica is a redish-pink shade of polish that dries to a satin finish. I've been so torn about this polish since I put it on, I think I normally wouldn't pick out this color for myself. But that's just my personal preference. The shade is very difficult to pin-point in these photos but in person it definitely leans more towards a red than a pink. I was so nervous about possible staining, however, my nails are happy to report there was none of that happening here. Side bonus: I love that it compliments my skin tone. 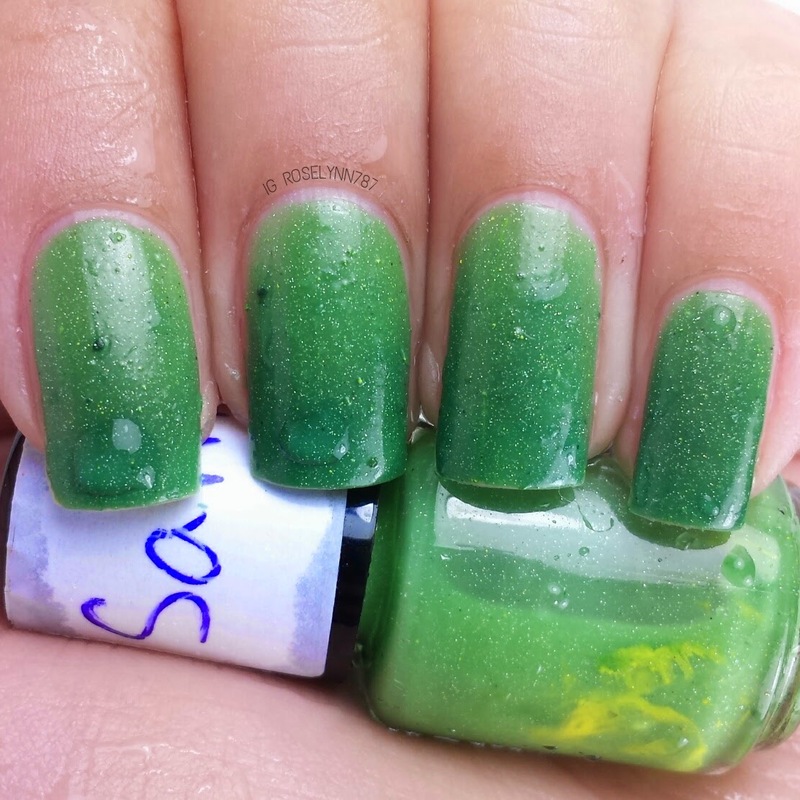 Swatched over a clear base, used three thin coats, and no topcoat was added for these photos. Since this beauty dried to a slightly matte finish, I wanted to show that and added no topcoat. This polish was very sheer in the first coat and required at least three thin coats for full opacity. Formula was good, not too thick nor too watery. Overall Cherise has done a terrific job with her True Blood Collection and I think fans (of polish and the show) will be very pleased. It's a diverse collection with a little something for everyone. The glitters in the collection definitely outshine the others for me. And if I have to pick a single favorite then it would have to be Andy hands down, it's polish must-have. The True Blood Collection pt. 1 releases this Friday, June 6th. Make sure you nab your favorite in time for the season premiere! 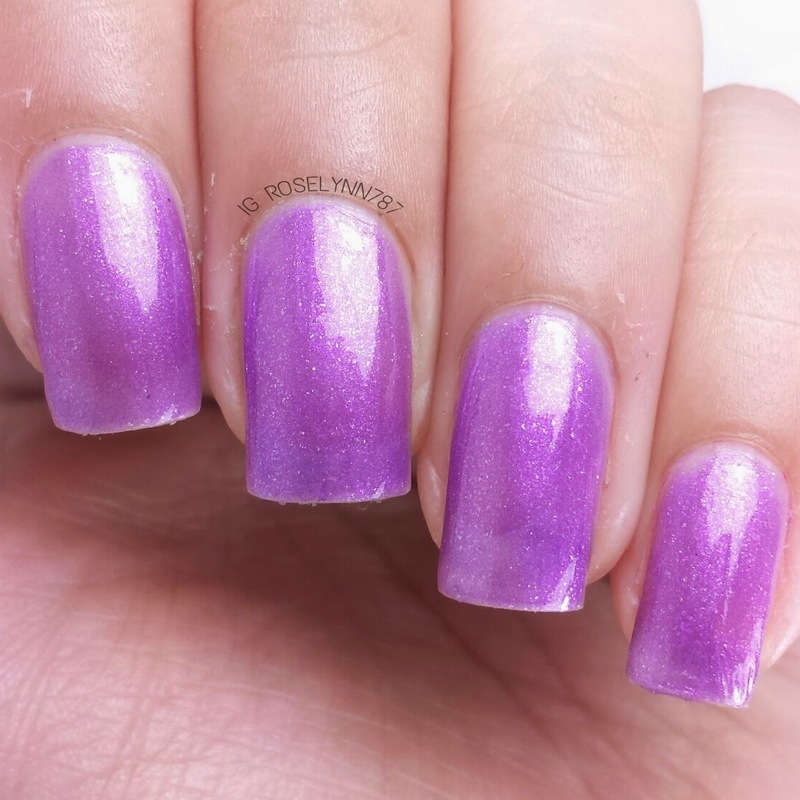 Follow My True Love Polish for stock info. and new polishes releases! Are any of you guys fans of True Blood? If so, which one of these beauties do you think you'll be wearing for the season premiere? Love your nail swatches they are absolutely gorgeous! 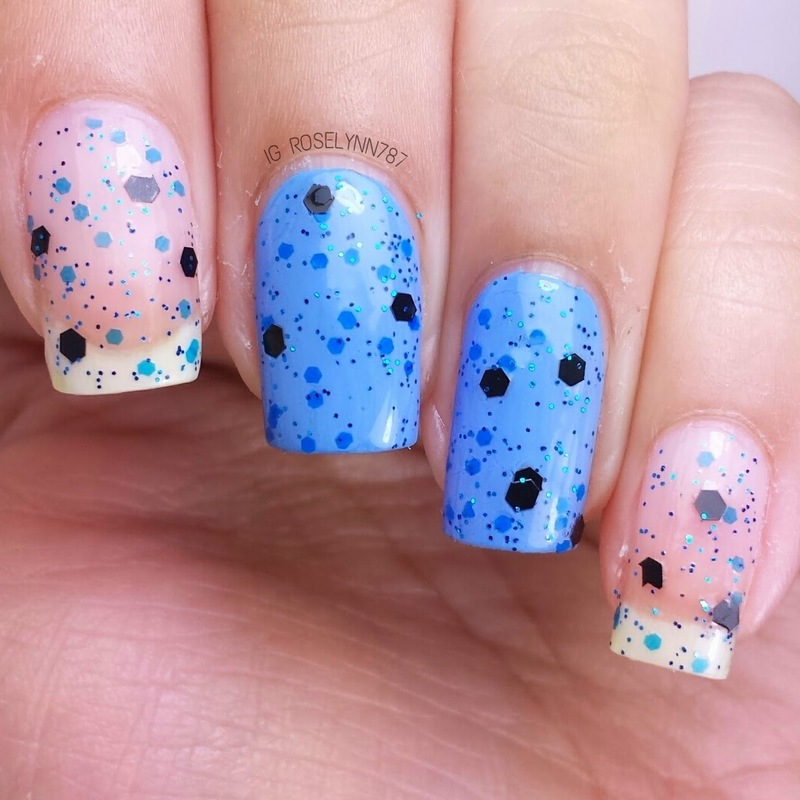 Thanks for sharing this with us on #ManiMonday! Love and Doves! 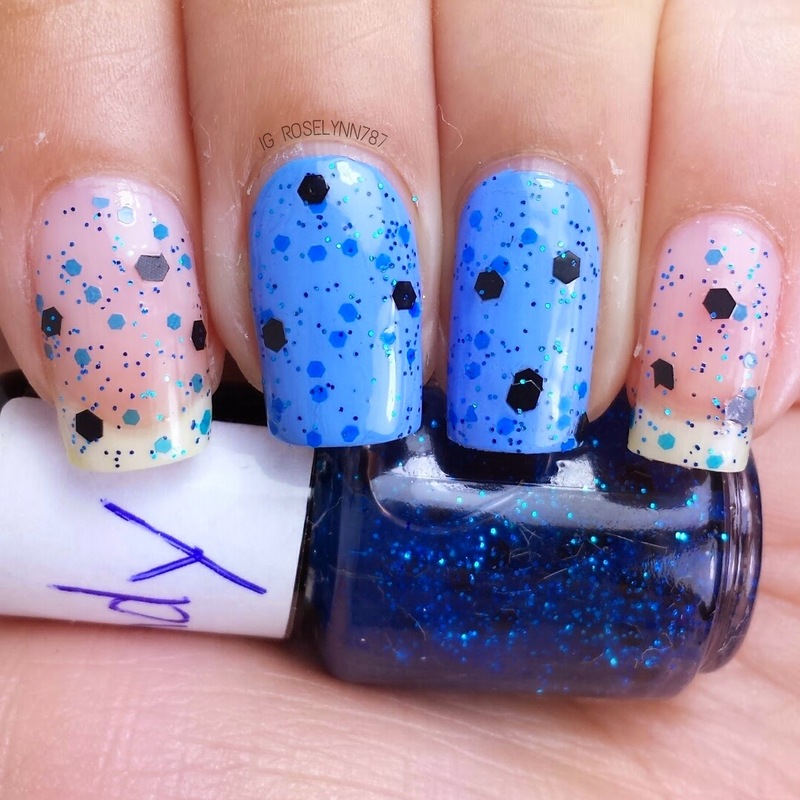 Thank you for stopping by :) Good polishes definite help a swatch come to life, I can't wait for the release this Friday.